"Fans of all ages love to start each and every day the Mary Engelbreit way with one of her colorful, insightful, and irresistibly charming calendars. 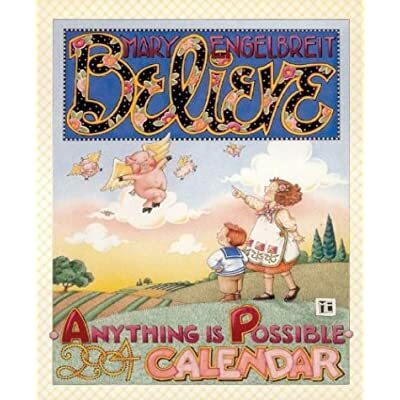 For 2004, Mary Engelbreit and AMP brings you a wide array of witty, useful, and uplifting calendars, which are sure to "breit"en your every day throughout the year. "I'll believe it when I see it" is a common phrase used when we find ourselves being skeptical about something. In Mary Engelbreit's new wall calendar, she reinforces the fact that we have every right to believe in whatever we wish, whether it's our own strength, our thoughts, or whatever is in our hearts. With twelve never-before-seen images joined with large planning grids, this calendar is sure to be a favorite for any Mary fan!